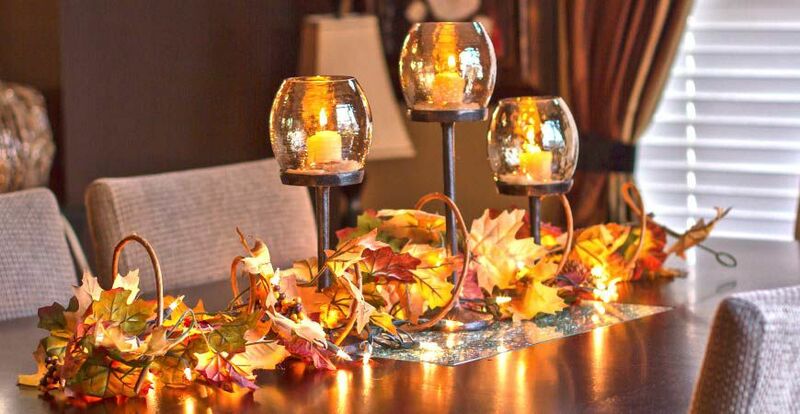 A simple Autumn centerpiece can also be used for Thanksgiving day. You may purchase silk autumn leaves to distribute but I prefer preserved leaves. To preserve leaves, use freshly fallen leaves that are still vibrant and pliable. Avoid leaves that are curling at the ends or those that have rips or rotted spots. Make sure to leave a little space in between each leaf to prevent them from sticking together as they dry. Then arrange leaves around glass candle containers. Another easy centerpiece for Thanksgiving would be to use the leaves as space fillers in a cornucopia basket, Fill a cornucopia with miniature gourds of various colors, filling in opens spaces with freshly preserved leaves. Fresh preserved leaves will last for approximately 60 days.